GeriActors Theatre is an internationally known and Edmonton based not-for-profit company creating and promoting intergenerational theatre. Adhering to the principles of Creative Aging, they believe that seniors’ engagement in the arts at a level of comparative mastery leads to significant health benefits, an overall sense of well-being and a marked increase in social and civic engagement. Working intergenerationally, seniors have more creative energy and greater opportunities for expression. The stories they tell and the theatre they create are entertaining, but also challenge stereotypes, strengthen memory, develop skills associated with performance, and articulate issues of aging. Their mission is to engage seniors and intergenerational groups in which seniors are included in theatre and performance-related activities, and produce theatre of meaning for their performers and audiences. Founded in 2001 by Artistic Director, David Barnet, GeriActors is supported by the SAGE Seniors Association and the University of Alberta Department of Drama. They have received funding from Age Friendly Edmonton, the New Horizons for Seniors Program, Alberta Lottery Fund, Edmonton Arts Council, Alberta Foundation for the Arts, Edmonton Community Adult Learning Association, and ATB Financial. They are the recipients of the TELUS: Courage to Innovate Award, and were the research focus for the international research project Theatre as a Pathway to Healthy Aging funded by Canadian Institutes of Health Research, which examined the impact of intergenerational theatre on the health of older adults. 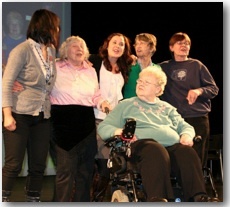 GeriActors has two main areas of activity: the performance company, GeriActors & Friends (G&F) and their Outreach Programs. The GeriActors & Friends are seniors from Edmonton and area and the ‘Friends’ are students and alumni from the University of Alberta. The cast range in age from early twenties to late eighties. Using a playful approach to theatre they produce original plays based on stories and issues of aging. They write plays by playing games, telling stories, improvising, and taking elegant coffee breaks with free flowing discussion. Humour and music are central to their work; laughter makes accessible even the most difficult subject. They give 12-18 performances a year to audiences of seniors and their families, students, health professionals and the general public. Their Outreach Programs involve seniors from all cultural and socio-economic backgrounds in a wide range of theatrical activities. No experience required. All mobilities welcome. Programs have included: workshops in performance storytelling, dance and acting; GeriActors Summer School; JP Drama: Just Play! (in collaboration with Jasper Place High School); FEST (Festival of Edmonton Seniors Theatre); RapidGeris (with Rapid Fire Theatre); Under One Sky (a multicultural storytelling project); and their Facilitator Training Program. 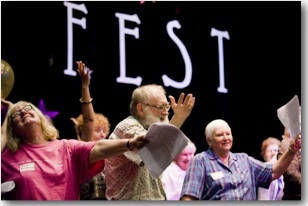 Workshops are offered in seniors centres and residences, libraries, schools, and as part of FEST.